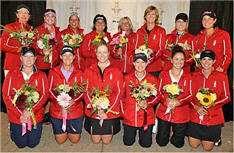 US Solheim Cup team- White women only need apply? The biennial matches begin tomorrow in Sweden. Welcome to the women’s version of the Ryder Cup that pits 12 of the best Yanks against 12 of the best from Europe. The biennial trans-Atlantic match-play pressure cooker beginning Friday in Sweden is three days and 28 matches of tension â€” eight foursomes, eight four-balls and 12 singles. At stake is an 18-inch Waterford crystal Solheim Cup that carries an enormous amount of weight. “If you put something in the oven that normally cooks at 325 degrees, the Solheim Cup is like taking it and turning up the heat to 500 degrees,” says Dottie Pepper, a former U.S. Solheim Cup star who won 17 times on the LPGA tour and is now a golf analyst for NBC and Golf Channel. “I always made an extra bathroom stop on my way to the first tee because I was feeling a little nauseous. The intensity and pressure affects your body. Expect more reflux-inducing moments this weekend at the Halmstad Golf Club on Sweden’s west coast, where more than 100,000 flag-waving, mostly pro-European fans are expected to provide large doses of patriotic zeal that can shake even the most grizzled veteran. The Americans lead the series 6-3, including a 15Â½-12Â½ victory in 2005 at Crooked Stick Golf Club near Indianapolis. But foreign soil has been unkind to the Americans, who are 1-3 overseas despite, on paper at least, being favored each time. In their last visit to Europe, in 2003 in Malmo, Sweden, Europe stomped the USA 17Â½ to 10Â½. King, at first-time captain, knows retaining the Cup is a tall order â€” especially because four of her players are Cup rookies. In addition to Lincicome, Morgan Pressel, 19, Stacy Prammanasudh, 27, and Nicole Castrale, 28, also make their debuts. Though the Solheim Cup offers a unique type of pressure, King says her first-timers have successfully dealt with stress and anxiety on the golf course. Lincicome has won two events, including the 2006 HSBC World Match Play Championship; Pressel became the youngest major championship winner at the Kraft Nabisco Championship this year; Prammanasudh has two wins; and Castrale beat world No. 1 Lorena Ochoa in a playoff this year for her first win on tour. King also has established Solheim Cup veterans Juli Inkster, Pat Hurst, Cristie Kerr, Laura Diaz, Angela Stanford and Steinhauer. Her two remaining players â€” Paula Creamer and Natalie Gulbis â€” made smashing debuts in 2005, going 6-2-1 between them. The Solheim Cup, since its inception in 1990, with only one exception, has been won by the team hosting the event. So the home team has a big advantage. I’m picking the US to win this weekend. Annika is off form, and I don’t see any of the Europeans picking up the slack. Final outcome- US 15, Europe 13. What I find most interesting is the omission of Christina Kim from the 2007 Captain’s selections made by Betsy King. Though I should have hardly been surprised. In 2002, 2003 and 2005, Dorothy Delasin was either 11th or 12th in Solheim Cup pts. (She was 12th in 2002 or first alternate and 11th in 2005 and either 11th or 12th in 2003) before the Captain’s selections were made. In each instance Dorothy was passed over. Various reasonings were made, either a player was selected over her because they had team spirit(Kelli Keuhne’s Captain’s selection in 2003, even though Kelli was stinking up the tour(16th in the Solheim Cup pts and no higher than a 9th place finish) in 2003 and was 0-4 when playing for the 2002 US team) or that Dorothy had no Solheim experience. Funny but that didn’t stop Patty Sheehan from picking Heather Bowie a rookie for the 2003 squad or Betsy King from picking Nicole Castrale this year. The Castrale pick over Christina Kim, who many considered the spark plug of the 2005 winning US squad is what makes me scratch my head. 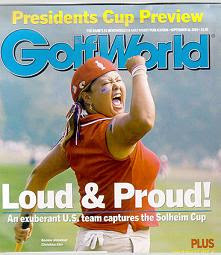 Just look at the 2005 Golf World cover and who the magazine chose to feature. So why wasn’t Christina, who was 14th in this year’s standings, not picked over Castrale when Christina had prior Solheim experience and obviously gets fired up for these events. Could it be because Christina, like Dorothy Delasin isn’t white? Both players are Asian-American, Korean and Filipino to be precise. I’m seeing a trend and a very ugly one. Past captains have used one justification or another to bypass Dorothy for three straight Solheim Teams. When Christina fits the qualifications, she gets passed up too. Tell me what other reason makes sense? I’ll grant two points in favor of some of the last Solheim Captains. The 2002 Captain did pick Pat Hurst, who is half Japanese, for the squad. (Pat and Stacey Prammanasudh who is Thai-American, both made the 2007 squad based on the points standings) On the other hand, Pat is very popular with her fellow pros. The 2005 Solheim Captain was Nancy Lopez. Nancy is hardly white. On the other hand, Heather Bowie had never won a LPGA tournament before being selected for the 2003 team. A real head scratcher, when you throw in Heather’s dismal 2003 Cup results of 0-3. Dorothy had three LPGA wins before that year’s Cup, four overall now. I don’t know whether Christina or Dorothy is popular among their fellow pros. A few Golf Channel announcers were also perplexed by Christina not being picked by Betsy King, so I’m not alone alone. So if a Asian golfer can’t make the Solheim Cup team based on the standings, she might as well forget being picked by the Captain. Anyone want to disagree with me? Beth Ann Baldry- Britain, Canada, what’s the difference?